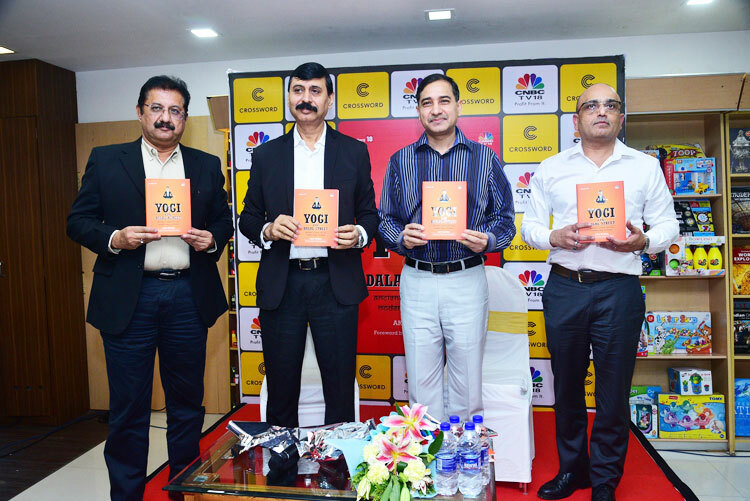 Pune: 13 August, 2018 – ‘Yogi on Dalal Street’ book authored by Mr. Arun Thukral, MD & CEO, Axis Securities was launched at Crossword book store in Aundh, Pune. Mr. Retesh Kumaarr, ADG & Director General of Police, Wireless Maharashtra State was the chief guest on this occasion. This book goes beyond the basic investment framework to dive deeper into how our mind works and how we can calm our mind to make right investment decisions. It draws reference from various scriptures, especially the ‘Yoga Sutra’ to explain 22 traits which affect the behaviour of an individual. It demonstrates that by strengthening the positive traits and minimizing the negative ones, we can be successful in every endeavour including investing. This book has been written as a guide for the modern day investor. Anyone who can stay true to the principles outlined in this book and internalize it will surely accelerate on the path of wealth creation. Endorsed by industry veterans like Vallabh Bhanshali, Nilesh Shah and the Director of the Yoga Institute, Hansa Jayadeva Yogendra, this book is the key to unlock the winning strategies encapsulated in our ancient scriptures for creating phenomenal wealth. According to Mr Arun Thukral, MD & CEO, Axis Securities and author of this book,‘’As a finance professional, I strongly believe that equity investments are imperative to help retail investors fulfil all their financial goals. In spite of this instrument being the key to unlocking financial prosperity, equity participation in India is still at around 5%. Hence, I passionately work towards creating awareness about the need and benefits of equity participation in India. My book ‘Yogi on Dalal Street’ is my endeavour to help Indian retail investors unlocks the true potential of equity as an investment option by tapping into the wisdom of our ancient sutras, particularly Yoga Sutra. As a certified Yoga practitioner, I find a deep connection between Yogic principles and investor psychology. With this book, I seek to help investors dive into the functioning of their mind and take control of their impulses to make better investment choices. I am confident that this book will serve as a guide for all investors on the path to financial prosperity’’. Axis Securities Ltd. (ASL) is a proud subsidiary of Axis Bank – India’s 3rd largest private sector bank. ASL is currently present in 80+ branches across India. ASL offers retail broking services under its flagship brand AxisDirect and also functions as a distributor to Bank’s financial products. AxisDirect engages in offering simplified investment solutions to the customers. AxisDirect offers a bouquet of investment products to its customers e.g. Equities, Mutual Funds, SIPs, IPOs, Derivatives, Bonds, NCDs, ETFs and Company Fixed Deposits. With over 17 lakhs customers, AxisDirect is one of the fastest growing players in the industry and is among the top 5 players in terms of customer base.